The next time you visit Falvey Library, look for the entrance exhibit featuring “Superheroes and Scholars.” You can’t miss the colorful renditions of Superman, Batman and Spiderman, all dangling from the ceiling as if in mid-flight. On the shelves below you’ll find their counterparts in the form of graphic novels and related texts. When asked about her inspiration for the theme of this year’s graphic novel event, Alexandra Edwards (library grad assistant by day, English graduate student by night) cited her search for a “meta-textual” approach to the exhibit. 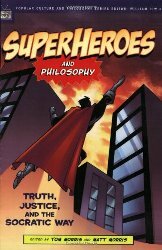 Then, when she least expected it, the idea came to her “in a flash!”: display the words of authors and philosophers as if spoken by superheroes. She, and others who contributed to the exhibit, worked to link those quotations with those who have written nationally recognized graphic novels. 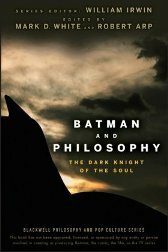 The words of Nietzsche (Superman), F. Scott Fitzgerald (Batman) and others are represented in the exhibit. Laura Hutelmyer, who developed and organized the graphic novel event at Falvey last year, worked with Alexandra on content. Joanne Quinn, graphic designer, brought the visual and artistic components of the exhibit together (taking superheroic steps to keep Styrofoam display materials from coating her work area). Check out the graphic novels from our stacks on display at the library entrance. Are there other graphic novels you think Falvey should add to the collection? Join the conversation!